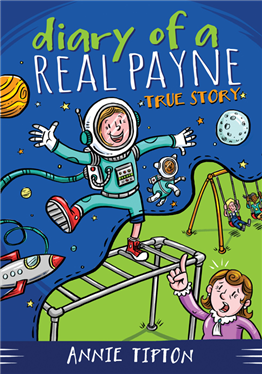 Diary of a Real Payne Book 1 by Annie Tipton is new out from Barbour Publishing. Emma Jean Payne, EJ for short begins writing to a her Diary, her mother's idea to help EJ get her imagination and feelings out. EJ age 10 is known for her imagination and dreams, big dreams. She has grand plans for her life and they don't include anything in Spooner Wisconsin, the most boring place ever she thinks. EJ's Dad is a pastor, Mom is a 2nd grade teacher, and little brother Isaac who is starting Kindergarten. EJ is constantly living life in her imagination. She imagines being in a Nascar race, becoming Queen Esther, being a mountaineer and a private investigator. Simple daily things in life just aren't as exciting as EJ's imagination! This was a really cute book, including a few illustrations which really added to the fun of it. I was glad that the fonts were different for the diary excerpts, the actual time events, and for EJ's day dreaming adventures. It really helped to keep it straight for me. I read the book aloud to my younger children. My 5 year old son enjoyed the story and the adventures. I think I lost him once in awhile, but he would come back to hear more. My 11 year old son would have enjoyed it much more if the main character was a boy. My daughter thought it was great, but a little over the top at times. She isn't one for taking a lot of risks and being adventurous. It was a great Christian story, with Mom even asking EJ in the beginning if she believed God had great plans for her. I loved that early on we see that Mom is such a patient, loving character and brings EJ back around to God having a great plan. I would love to model my day after EJ's mom, she was just such a wonderful character! I really connected with her. There were several fun, and whimsical characters like Ms. Winkle the neighbor lady and old grumpy Mr. Johnson. This was just a fun book to read, something to get the kids away from electronics and into hearing a story. It is perfect this time of year as it leads up to Christmas and includes some really great things that the Payne family did to celebrate the reason for the season. The book sells for $5.99 and is currently on sale at Barbour for $4.49. This would make a great Christmas gift for your girls ages 8-12. The second book in the series Church Camp Chaos is due out in March of 2014. See what my Crew mates thought of this entertaining book by clicking on the banner below.